The Atlanta Allstars | Book or Hire The Atlanta Allstars Band for your private party, wedding or corporate event today. | The best, out of this world party band that the South has ever seen! 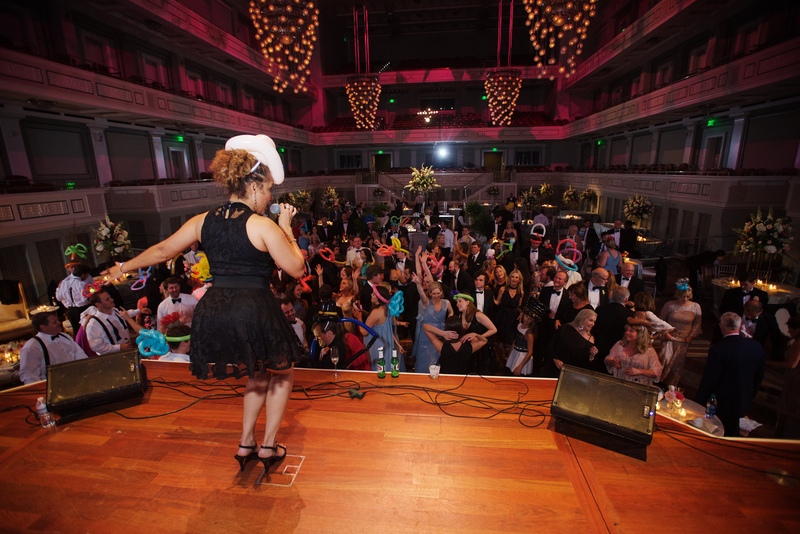 The Atlanta Allstars, are an absolute, out of this world live, party band, perfect for wedding receptions and private parties with an outstanding cast of superb musicians and vocalists. This excellent wedding band is geared to please any audience, ranging from hip-hop, to classic jazz, big band and swing, from intimate settings to major events and concerts. Every member of this star studded variety band, is a seasoned veteran in all aspects of music, including musical productions and recordings. Prime Source Entertainment Group, LLC is proud to be the exclusive booking agent for The Atlanta Allstars. The Atlanta Allstars consist of ten to twelve outstanding musicians, with horns and is fronted by the most incredible lead vocalist and entertainer in this business. The party band also has two amazing female vocalists. With every member in the fabulous dance band also being vocalists, there are limitless possibilities for a song list. And this live band takes full advantage of that fact. 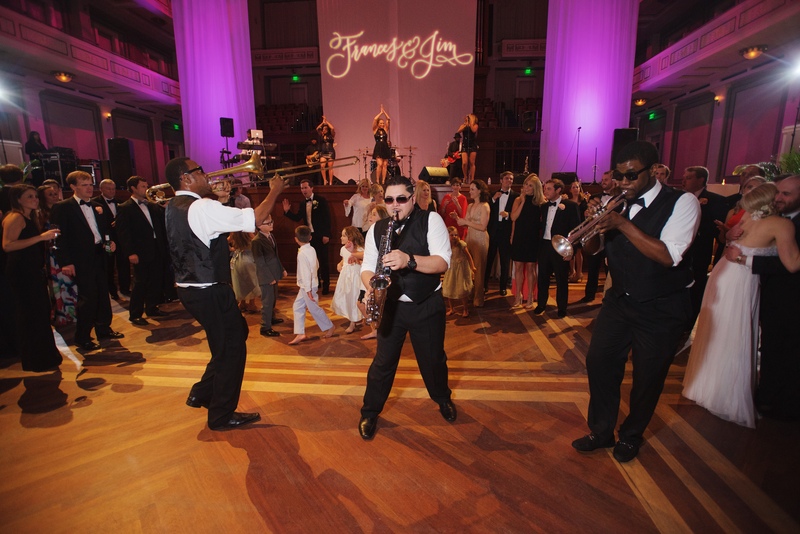 One of the southeast's top wedding bands, The Atlanta Allstars will take your event to the next level. 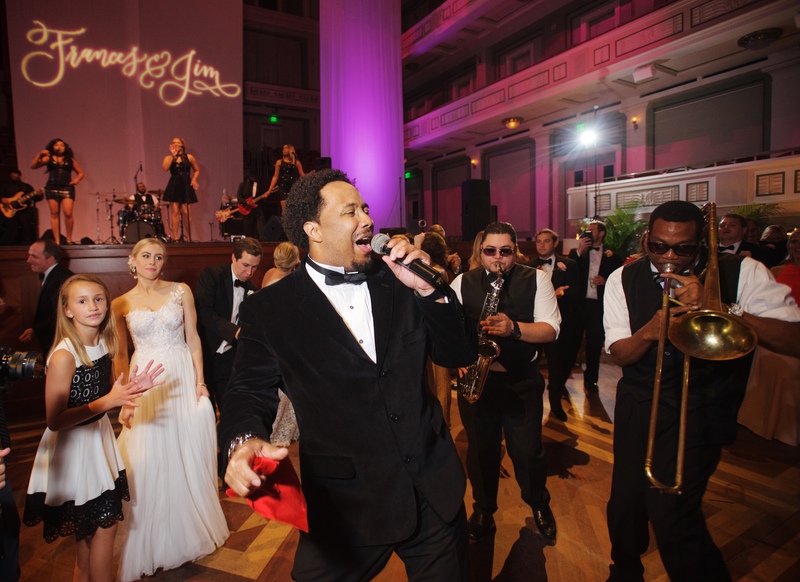 The lead singer, Darren Leslie, is no stranger to audiences and event coordinators nationwide. He has graced the stage with some of the biggest names in the music industry, performing with Kool & The Gang, The Temptations, Debbie Gibson, Jewel and the SOS Band. Darren has been the lead vocalist, choreographer and producer of many of Atlanta's best party bands for over seven years prior to creating the Allstars. Darren wrote the title song "Yes We Can" which was performed at President Barak Obama's inauguration. Darren has been a band consultant for The Atlanta Sound Band, Atlanta Rhythm And Groove and a host of others in the Atlanta Market. Whether doing background vocals, being an opening act, or even being a member of the event, Darren Leslie is simply one of the most exciting and interactive artists to date. Who else could pull Virginia's Governor Timothy Kaine on stage to sing "My Girl"? Who would have the nerve to convince First Lady Laura Bush to show off some dance moves of her own? Simply put, there's no event to big or small for this man, or this live band. Whether you are the bride to be, an event coordinator or planner, the only concern should be the date itself. The Atlanta Allstars travel with a road manager that will be onsite to help coordinate with all of the details. If there is a good time to be had, however, leave that part to Darren Leslie and The Atlanta Allstars. You bring the people; The Atlanta Allstars will bring the party. Click the "Book Artist Today" tab below for information on booking or hiring the Atlanta Allstars, a one of a kind dance/party band for your wedding reception, private party, college or corporate event. The Atlanta Allstars can consist of 10 or 12 pieces. The 10 piece consists of a 4 part rhythm section, 1 male lead vocalist, 2 female lead vocalists and a 3 piece horn section. The Atlanta Allstars can travel with ten to twelve pieces consisting consists of a 4 part rhythm section, 1 male lead vocalist, 2 female lead vocalists and a 3 piece horn section. Allstars will add two additional horns to make it a twelve piece. We couldn't have been more pleased with the "Atlanta Allstars"!!! Their energy and ability to keep the party going was amazing! Everyone had a blast and we loved that they included the audience on stage, etc. and that they also got down on the dance floor to perform and dance as well. I can't tell you how many people commented on how "they were the best band they had ever seen!" and wanted to know who they were and where we found them. Both Mike and I spread the word as much as we could. Please forward this to Lee and let him know how much we appreciate him referring this band to us. It made Krissie and Travis' night very, very special!! We LOVED the Atlanta Allstars!!! I can't even put into words how much we enjoyed them. I think from the second they started playing to the bouquet toss all of my family/friends were full of energy on the dance floor (& even took over the stage at times)! We didn't want the night to end. I wish we could do it every weekend! Hopefully, I will get to see them soon at another event! Darren Leslie and his crew are just awesome in every detail!! They arrive early, get out of the way for others to do their jobs, and arrive back at the venue , charged and ready to go!! All requests are honored in the kindest way!! He returns phone calls, makes the evening delightful and never complains!!! Every member of his band is gracious and kind. They are truly my favorite to work with and we always feel lucky to have them on our team. Denise Sikes and the Big Events crew! Everything went great! Darrin was very professional and the band was a lot of fun. The dance floor looked like a rock concert - I have never been to a wedding where everyone rocked so hard. The music was exactly what we were looking for, and it had the dancefloor packed with people and energy all night. I don't have a single complaint, and I would HIGHLY recommend them to play at a party of any one of my friends or family. They were awesome. It was a perfect evening, beyond any and all expectations! The Atlanta Allstars are amazing! We had a high energy party, ready to go, and they read the crowd and lead the way. People have commented on how great it was when the horn section came into the crowd; the lead female vocalist had power, range, and great stage presence. Darren was awesome announcing & leading, and when they hit a high energy song that had the crowd going, he knew to ride it. We only wish we had even more time, because the party was awesome. Everyone took note of Atlanta Allstars, so we hope to see them in Jax again soon! I know I'm a little delayed, but I just wanted to send you a note to let you know how amazing the Atlanta All Stars were. My reception was just as I imagined it, and they played a big part in that. People were on the dance floor all night, and they even humored my aspirations of wanting to be in a band and let me get on stage with them a lot. I had the absolute best time, and many people have asked me who they are and raved about how it was one of the best wedding bands they had ever heard. Please thank them for helping to make my reception the night of my dreams. Also, thank you for all of your help along the way! You were always so prompt with responding to emails and very informative. Definitely took some stress away! I look forward to hopefully working together again in the future! A special thanks to Darren and the Atlanta Allstars for making my daughter and son-in-law's wedding reception one to remember. The band's nonstop energy, their smiling faces and their incredible sound were the formula for a fantastic night. Even though I had read comments about the band before booking, you tend to treat those lightly. But, trust me, they are the real deal! The Atlanta All-Stars are an amazing band! We cannot even begin to describe how wonderful they were and how much they added to our special day. The energy level and talent that they bring to the table are priceless! Every person at the wedding was dancing at some point, even the grandparents wanted to enjoy dancing to the All-Stars. All of the feedback from our guests, young and old, was not only positive but they all went as far to say that this was the best party/ band EVER! We will remember our special day forever but the All-Stars are a big part of that memory. Thanks again to this fantastic group of people and we wish you the best! Wow. What a great time everyone had at our daughter's wedding this past Saturday. The Atlanta All-Stars were incredible and absolutely MADE the reception. I bet I had 50 people tell me that it was the best wedding band they had ever heard. Darren, you were so easy to work with and handled the MC duties flawlessly. Thanks to both of you for a fabulous experience. It exceeded all expectations. Please feel free to use me as a reference for the Atlanta All-Stars in the future. And, I'll be contacting both of you when my youngest daughter takes the plunge so we can do it all over again. On April 30, 2011 we had the pleasure to have the Atlanta Allstar Band perform at our daughters wedding at Serenbe, outside of Atlanta, Georgia. They performed beyond our expectations! From the first song they played to the last song of the evening, we did not ever have an empty spot on our dance floor. They kept the crowd going from the beginning to the end. Their talent was amazing from the brass, to the guitars, to the singers. And Darren Leslie, wow! We cannot thank this group enough for their performance, for letting our guest join them on stage to sing with them. They truly rocked the house. Our guests are still talking about this band and asking where and how we found them. We have another wedding in August. I only wish it were in Atlanta, our band would no doubt be ATLANTA ALLSTARS!!! This is Tyler Thurston Jeffrey! I am so sorry it took me so long to respond to you! We got back from our honeymoon last Tuesday and we have just been running around trying to get everything settled in our new home! But nevertheless, I am so happy to report about the Atlanta Allstars. It was honestly my dream reception. Everyone, and I mean EVERYONE, was coming up to me asking who the band was! They blew us away! They exceeded the expectations! They were exactly what we wanted, and I just couldn't believe it when I looked up there and saw a this HUGE band that was playing for OUR Wedding! We even had some guests that were not wedding guests, but guest of the hotel, stop in and ask my parents who they were because they wanted them for their daughters wedding. Their energy was contagious, their talent level amazing, and Darren was absolutely fantastic! So great and professional and had a big smile on his face! It was AWESOME! I could go on and on, it was the best night of our lives! We loved the hornline, the backup singer, the guitarist (oh my gosh, the rendition he did of Purple rain, he played the guitar behind his HEAD! It was amazing!). One of my husbands best friends and groomsmen has a band that tours throughout the midwest and the Western states and he graciously asked the band if they wouldn't mind him joining them for a song. The band let him and they just rocked the house! We have so many good memories from the night and they made it amazing! I just cannot believe how fast it went. But seriously, it was my dream wedding (despite the monsoon that ensued outside!) it was still the very best day of my life! Thank you again for all your help, especially in the weeks leading up to it when things got so stressful! We will most certainly be using Prime Source again in the future! Please tell the band thank you for all that they did to make our Wedding Reception the best night of our lives and for all that they did. We absolutely loved them! I just want you to know that the Atlanta Allstars were AMAZING on Saturday night for the Simmons Wedding. They sounded phenomenal and were an absolute blast. The client and the guests could not have been more happy. They loved them!! Darren and his band were extremely easy going, professional and so nice to work with. They looked great and sounded awesome. The extra horn player was terrific. They NEVER stopped to take a break and absolutely went above and beyond to make everyone have a great time. Darren's attitude was if "they didn't stop to take a break, he wasn't stopping!" It was fabulous and everyone raved about them. I think the best was when Keith, Barton, Lauren and Brian all got up on the stage to sing their own rendition of "My Girl" - it was truly priceless. And, the fact that so many people stayed until the very end just to dance longer. Lauren didn't want the night to end. I hope the band gets many more bookings from this wedding - especially since the groom's family is from Atlanta! I would refer them a million times over. I absolutely loved them and loved working with them. And, cannot wait to book them again. Thank you so much for your help in making this night so magical for the Simmons family. It was a home run! Darrin and the Atlanta All Stars did a fabulous job at the Heritage Ball. Darrin and his female side kick really know how to work the crowd. They did a lot of interactive numbers that required audience participation and then when time to get down...... Really blew the socks off people. Thank you for a great job. They were fabulous! Received rave reviews from everyone. I suspect they will have several bookings from the wedding. Guests were incredulous-many asked how I found the band-I gave you all the credit for being great to work with & super reliable. Thank you for helping to make their dream come true. I think everyone in the room loved them and no one left the dance floor! Definitely made our party a huge success! 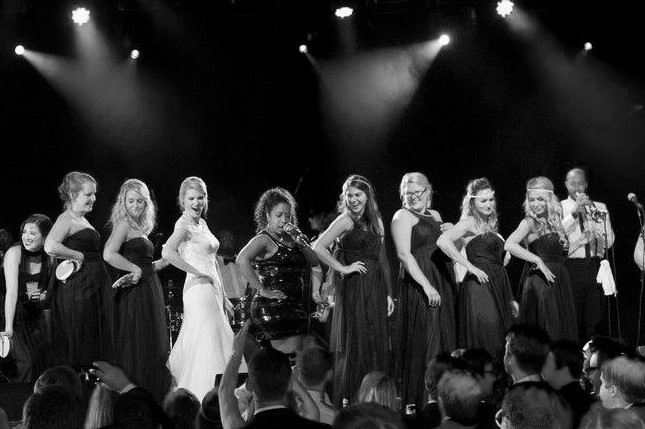 Ladies, I believe I already passed along this information back in May but this is the band that we worked with for my sister’s wedding…..the band was phenomenal to work with and they put on a fabulous show! All 400+ guests were dancing and having a great time J and people are still remarking about how much fun it was at the wedding. I believe this band would be a great asset to our clients. I hope we can bring the band here soon!